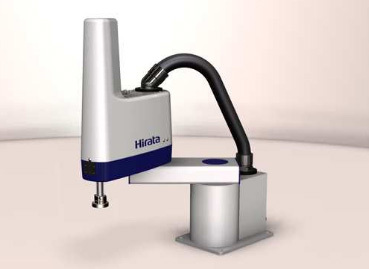 Hirata has not only offered stand alone robots since 1978, but also conveyors, feeders and entire suitable robotized systems. We create optimum automatic systems for your needs providing full technical and engineering support. We are planning, designing and building the system. Finally our automation experts are ready to install the system and to teach your operators. 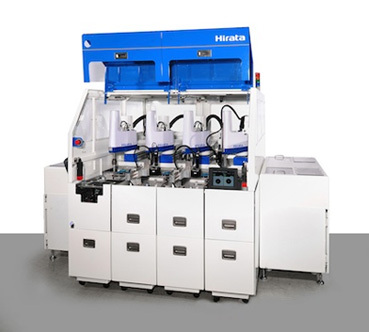 Hirata is producing various types of robots. There are two main robot structures SCARA robots (jointed arm) and cartesian robots. Depending on customer’s need and application requirements you can always select out of the different models and types for the best solution. Do you have a current project for automation – don’t hesitate to contact us. 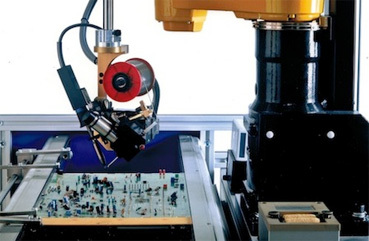 For some typical requirement we have semi-standardized solutions like soldering robots, palletizer and insertion robots for odd shaped electronical components. 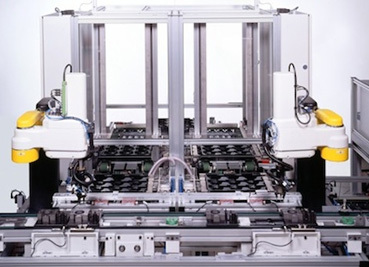 The system consists out of two tray feeders and two SCARA robots. 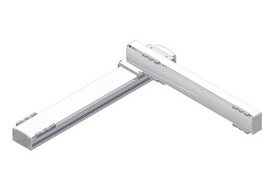 The tray feeders are linked together with a conveyor of the pile of empty trays. Additionally the tray feeder is equipped with buffer segments in order to increase the buffer capacity. The deep draw trays are made out of very thin material which pose a great challenge. Because the trays cannot be fixed by form fit but it have to be fixed through vacuum grippers. The system consists of a twin tray feeder and a SCARA robot between. Each feeder is designed for a certain tray size because the tray size of the raw parts is 400 mm x 300 mm and the try size of the finished parts is 540 mm x 360 mm. Furthermore the system is equipped with a vision system to correct the place positions of the robot at the work piece conveyor. 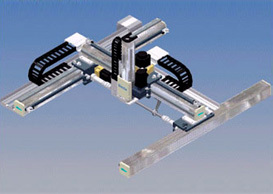 The system consists of a standard tray feeder with reversed tray flow direction and a SCARA robot. The size of trays differs depending of the product between 400 mm x 300 mm and 450 mm x 450 mm. The tray feeder can be adapted to the different tray size by interchange parts. 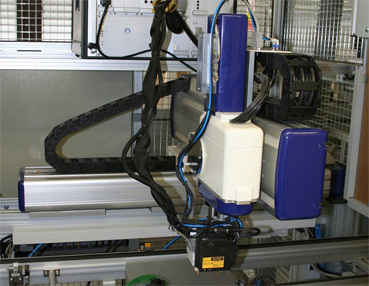 The system consists of a twin tray feeder with one SCARA robot. 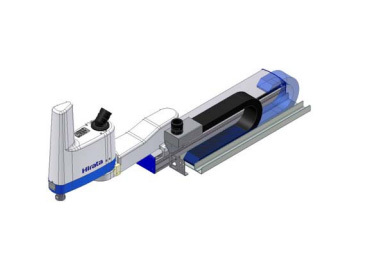 Each half of the tray feeder is linked together by a conveyor which transfers the piles of empty trays from one feeder to the other. Thereby the manual handling of the empty trays is omitted. Furthermore the piles of full trays are feed in and out by a cart. The standard design of the tray feeder is modified that the system fits into a standardized assembly line module. The tray feeder has a rather flat extension to feed in and out the tray into the assembly module. 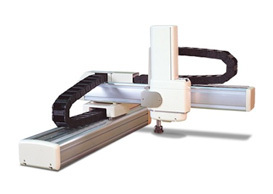 The system consists of a standard tray stocker and a Cartesian robot. Additionally operations are proceed with the robot in this machine. The robot applies heat-conductive paste and measures significant points of the housing where the pcb is placed. The full trays of raw parts are provided by a small cart in the tray feeder. The design of the carts is special made to fit as a part of the tray feeder if the cart is attached to the feeder. The system consists of a standard tray feeder with several buffer segments and an additional device to locate the inlay of the box. This tray feeder is manufactured according the strong specifications of the motive customer. 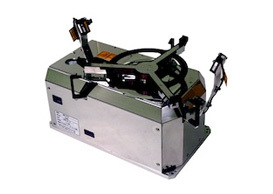 This system is designed to assembly a small magnetic clutch which is used in household appliances. 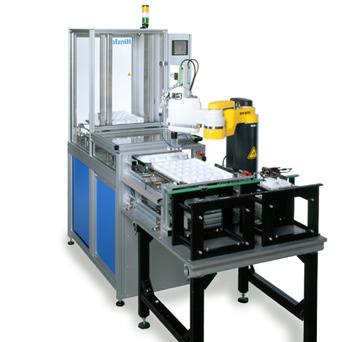 The machine consists of a turning table, two assembly robots, feeders, presses and adhesive dispenser. In case of dispensing of adhesive we differ between Potting and bonding/Beading. For both processes we are offering solutions for 1K and 2K material and are using well known dispenser makers. For poisitioning the dispenser head we are using Cartesian robots because of high path accuracy and higher payload. Also piping from pump to dispenser is much easier then other robot mechanism. This is a full-automated cell where the work piece will be feed in and out by a PCB conveyor. The robot moves the dispenser in u-shaped path to apply 1K material around a sensor. The speed of dispensing and motion have to be exactly synchronized. The dosage of material will be controlled by a laser sensor. Additionally the applied amount will be checked by a gauge. 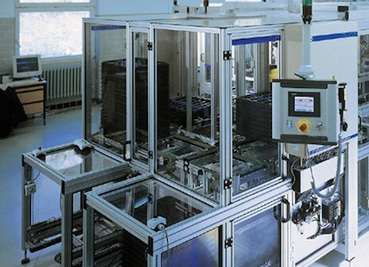 This is a semi-automated cell with manual feed in and out of work pieces. 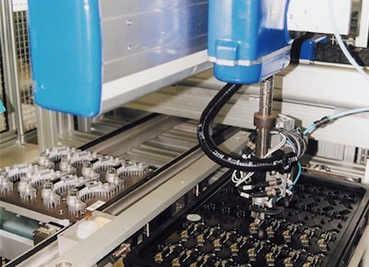 The robot perform a CPC motion and applies 1K material like a bead. High precision of motion and dispensing is necessary to achieve the required quality. A second robot with a laser band scanner checks the bead. An important process is measurement and testing within production. You can handle either the work piece by robot to bring it to the test equipment or robot can carry the probe and bring it to the work piece. 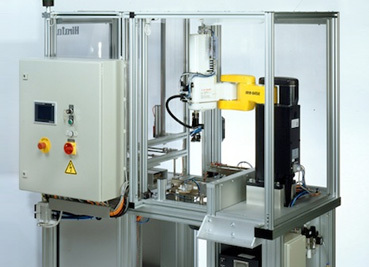 A Cartesian robot handles the probe and moves it to the work pieces which are located a work pieces carrier. The work piece carriers are feed in and out by a conveyor system. The robot controller communicates with the test computer and controls the entire cell. The robot handles the work piece and places it into the test jig. During testing the robot places the tested work piece into the tray and picks up a new untested piece. 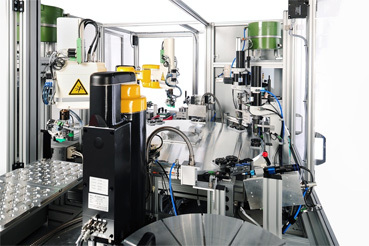 We are offering full-automated system with robots for odd shaped component insertion. 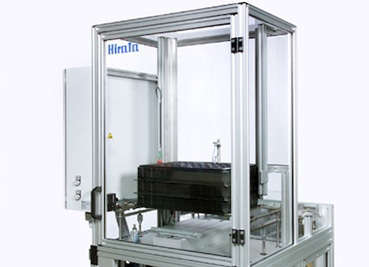 This cell consists of feeders, PCB conveyor, Insertion and Clinch robot. 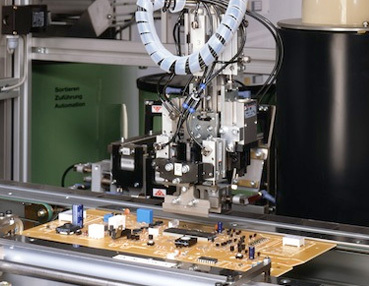 The soldering robot cell, LRZ series, is developed for stable and better quality for soldering process at the same or even less cycle time than manual soldering. 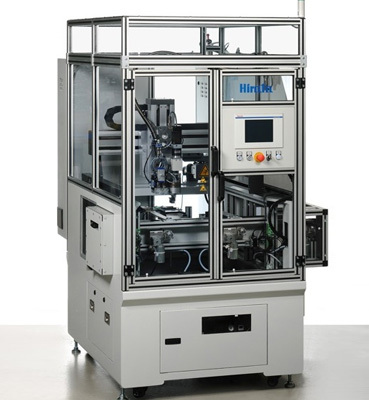 For automatic production systems a parts feeder to robot is one of an important element. If orientation and position of work pieces are not accurate, automatic system will not run efficiently. Frequently, sensitive or odd-shaped parts are not suitable for bowl feeders and vision systems will not be economical solution. These parts should be presented by trays which are available in the market and easy to transfer a reuse. 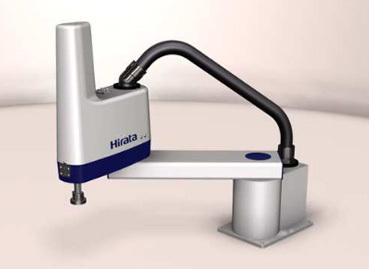 Hirata’s Auto Stocker solves your tray feeding problem economically. 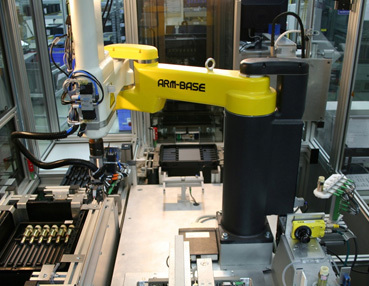 The Auto Stocker is designed as tray changing system to palletize or depalletize work pieces by robot. Its accurate positioning, fast tray change time and sufficient storage of trays meet the requirement of your automatic production system. 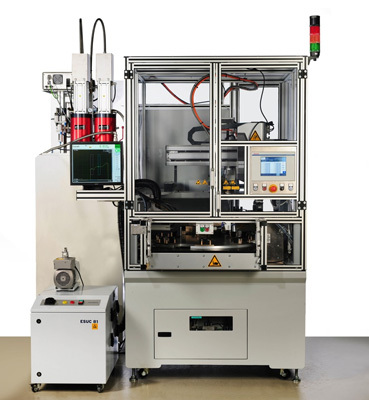 The typical applications for the Auto Stocker are for assembly operation, palletizing for injection moulding machines and loading/unloading work pieces for machine tools. 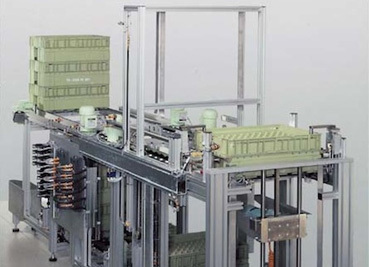 High Efficiency: The palletizer in combination with SCARA robot or Gantry robot is able to load or unload trays. Tray feeders for tray dimensions between 300 mm x 200 mm up to 800 mm x 600 mm are available. The maximum of tray stack weight could be 200 kg. Small footprint: The tray feeder model AST has a very small footprint and save a lot of factory space because the tray flow is vertically. 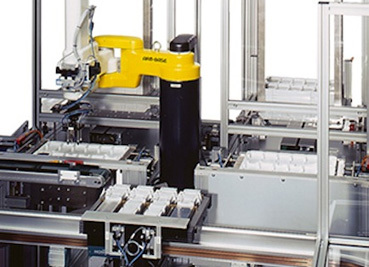 Full automation: In combination with a AGV tray feeders can be load and unload automatically. The robot models of AR-F series are four axes SCARA robots which are very well suitable for fast and flexible assembly and handling tasks. The AR-F series is the sixth generation of SCARA robot which Hirata developed and perform newest technology and long lasting experiences. 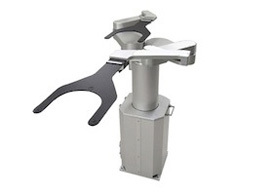 Best features and high economy are characterizing these robot series. 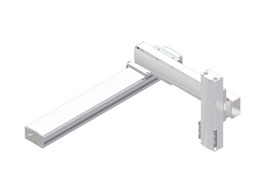 There are three models with different arm length of 450 mm, 500 mm and 650 mm available. 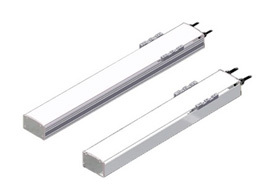 High acceleration and speed: The AR-F series perform a standard cycle time of 0.28 s.
Battery less encoder technology: Battery less Encoders makes maintenance easy and conserves the environment. Automatic acceleration calculation: Optimized motion by automatic calculation of acceleration and deceleration time. Batteryless Encoder technology: Batteryless Encoders makes maintenance easy and conserves the environment. Various possibilities of configuration: many selections in strokes, speed and payload. 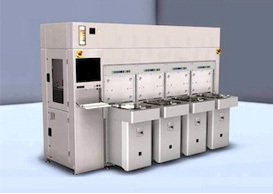 Assembly Cell ACS-MD is a modular structured production system for manufacturing of small electrical and electronic devices and units. 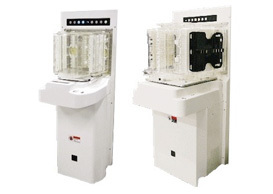 These cells can be used as a standalone machine or can be combined together to an entire production line. 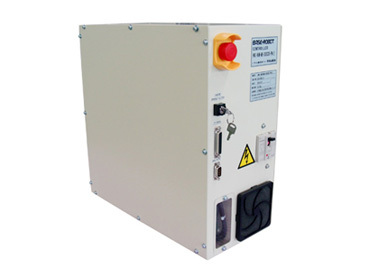 The controller provides all functions of a motion control and the ability to control the entire peripheral devices. Thereby it is not necessary to use a PLC for sequence control. 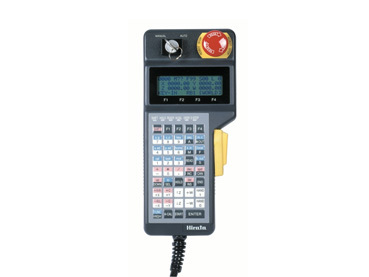 The controller is a micro processor system which is working with multi tasking. The Teach pendant can be connected to all control models. It can be used for operation and position programming of robots. The Teach pendant can be connected and disconnected if required. 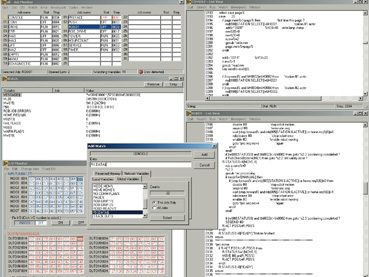 The software package HBDE (Hirata BASIC Development Enviroment) are used to develop application software and for debugging of programs. The programming language is based on BASIC and very easy to learn. It provides structured programming, subroutines, Marco commands and a lot of powerful commands.